When kayak fishing, camping or hunting, keeping my gear dry and free of debris is important. To help accomplish this I have been using the 42-liter (32 inches high, 11.5 inches wide and 11.5 inches deep) capacity Kaewa Drybag by Konus. The bag’s material is made from 600 denier polyesters laminated with TPU (Thermoplastic Polyurethane). The 42-liter bag is more than enough space to store anything you may need for a day or weekend trip. It has a nice padded shoulder strap and an air valve to let air out as I roll it up, or keep air in to float should I need it as a rescue device. Next up is the Kaewa Backpack by Konus. Although advertised as a waterproof backpack like the drybag, the backpack is not submersible because the two zippers do not close tight enough together. It seems nearly impossible to have a 100% waterproof backpack if zippers are involved. The zippers used on this backpack appear to be professional grade, thus ensuring the highest degree of protection from water and sand. I found by keeping the two zippers on the side this virtually eliminated moisture from getting in. It is great for walks, hiking or using on a motorcycle to keep items dry. The pack inside has several storage compartments, ranging from small to large. Its capacity is 1220 cubic inches and measures 18 inches high, 10.5 inches wide and 10.5 inches deep. In addition, the padded shoulder straps make it nice to tote gear. Overall, these products do a great job keeping items dry and free of sand. 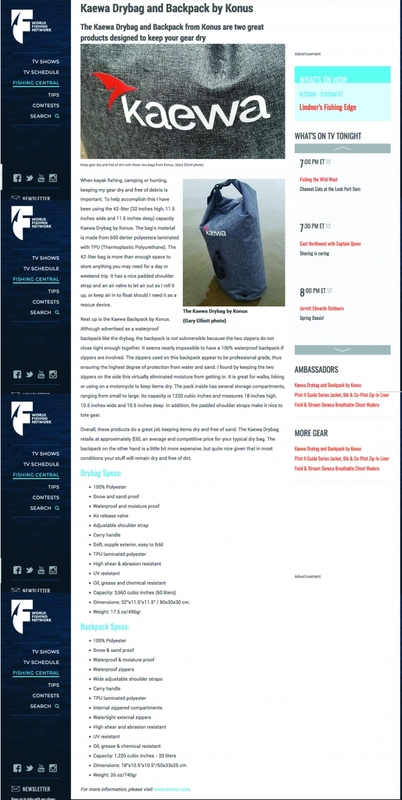 The Kaewa Drybag retails at approximately $30, an average and competitive price for your typical dry bag. The backpack on the other hand is a little bit more expensive, but quite nice given that in most conditions your stuff will remain dry and free of dirt. Dimensions: 32"x11.5"x11.5" / 80x30x30 cm.